As part of the ride experience in Gett’s rider app, one of the most crucial aspects is our communication with the customer, but even more specifically, their satisfaction with the riding experience. 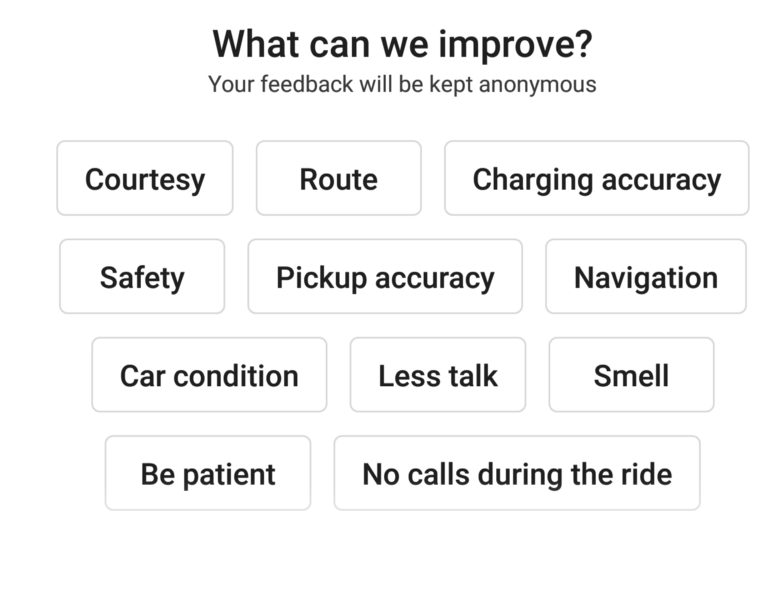 We constantly strive to find new ways to let our riders know their opinion makes an impact and that we’re highly interested to know when their ride wasn’t entirely satisfactory. Elements on the same line should be horizontally centered. If there isn’t enough room for a new element in a line, it should go down to a new line. As we started our initial thought process on how to build this, we were quite positive there is no built-in Layout or View in Android to provide this behavior, and already started imagining the horrors of manually implementing it with our own measurement and calculation mechanisms. We started thinking and realized that this layout behaves much like a well-known HTML element called div, and even more specifically — CSS’s Flexbox. To our surprise, during our research we came across FlexboxLayout. In essence, FlexboxLayout is a lesser-known layout, provided by Google which gives you the capabilities of Flexbox, out of the… well, box! - right in your Android environment. Excellent, this should make this a relatively painless implementation process. Let’s get started! Start by creating a new Android project. Set your activity name to MainActivity and your main layout to activity_main. First, you‘ll create the inner items. They will be single-line TextViews with a fancy border, that expand to fit their content. Start by creating some fancy drawable shape. You’ll use it in a bit as the background for your items. You simply create a TextView centered to its parent which uses the background you previously created. As a layout manager for a RecyclerView. You’ll be using the second option to achieve the Div-like behavior this UI requires. You’ll basically push an arbitrary amount of items into this layout, and it will arrange them for you in a flowing Div-like manner. You’ll need to add a RecyclerView to your main layout, as well as a Button for adding randomly-sized items. This adapter will take a list of Strings and inflate them into the items you just created. Before finalizing this UI, let’s take a moment to learn a bit more about what Flexbox has to offer. Flexbox can arrange your content as rows or as columns. This attribute is called FlexDirection in Flexbox terminology. Another attribute you’ll commonly use is JustifyContent, which basically answers the question — “how should your content be arranged on the chosen direction?”. Will it begin by adding items from the start, one by one? Maybe from the end? Or, you might want them to be centered on each row, or column, for that matter? I encourage you to experiment with the possible values of JustifyContent, to really understand the vast possibilities :-). Feel free to tap the bottom button to add additional random items to your list and see how the layout scales its arrangement to the amount of items. If you’re curious, try to also play with the JustifyContent attribute to see what kind of different visual results you can achieve with it. The source code for this post is available on Github. Code, stories, tips, thoughts, experimentations from the day-to-day work of our R&D team.